Kegel Sport unbiasedly offers two different disciplines, the well known Tenpin bowling and also the – new to Australia – Kegel 9-pin bowling. Important Consideration: Unless you are wanting to run official competions at your home or venue, the below information can be adjusted or combined to suit your requirements. Infact, we reccomend taking the best bits from each to get the most out of your bowling installation. The most obvious difference is in the formation of the pins. Kegel pins are positioned in a diamond formation while Tenpin is in a triangular formation. 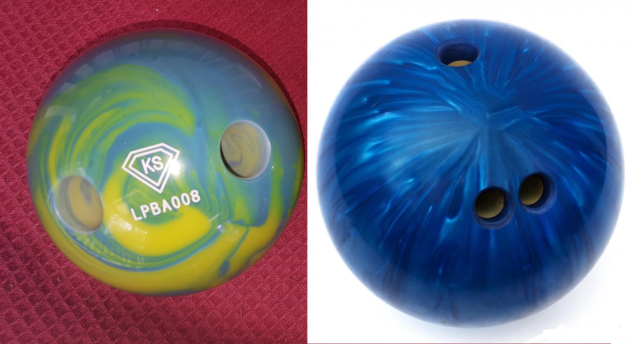 The diamond pattern of Kegel and the increased spacing between the pins makes it considerably harder to bowl a strike. This puts greater value on strikes when they are achieved as well as presenting a greater level of difficulty for intermediate to advanced bowlers. The other noticible difference in pin behaviour is how the pins can be bowled down in a straight line. For instance, if a ball is bowled straight down the middle it is likely to only knock over the three center pins. Although the discipline of Kegel is of greater difficulty it is still well received by novice and junior bowlers. 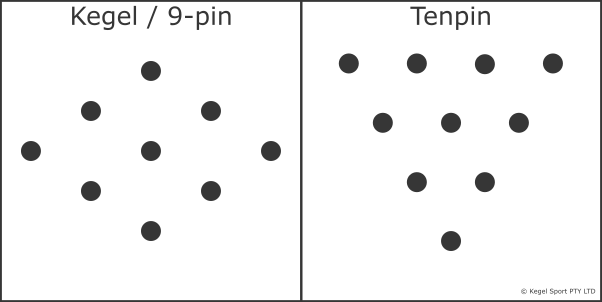 Tenpin has a higher rate of strikes and the closer proximity of each pin creates a more irratic pin behaviour. The Tenpin formation is a much more forgivable layout for novice and juniour bowlers. The official lane dimension are different in both Tenpin and Kegel. With Kegel being slightly longer and wider. see Diagrams below. Important Consideration: These sizes are official sizing and can be customised to suit your space requirements. We generally advise to not go any shorter than 12 metres, so as not to hinder the bowling experience. Tenpin lanes also generally have a small amount of oil applied to the surface to allow bowlers to spin-bowl. However, this is optional and would require a cleaning and oil application machine, which can be quite costly. We generally don’t recommend applying oil as it leads to more costs and oil build-up in and around the machine room. The same enjoyable game can be played without an oiled surface. The shape is the first notable difference between a Tenpin pin and a Kegel Pin. They both behave in slightly different ways because of the difference in shape, core and also the type of ball used. Tenpin pins have a wooden core which is what gives them that nostalgic sound when hit. Where as the Kegel pin is made from the same material but does not have a wooden core and instead is solid. Both balls are made from the same materials but are different in size and finger hole formation. Tenpin balls range from 6lb to 16lb and also a number of different sized finger-holes, which presents the challenge of needing a range of balls to suit each bowlers requirements. Kegel balls are all the same weight (6.3lb), size (16cm) and a standard finger-hole size, which allows a one size fits all. Children as young as 4 years old have been able to use a standard kegel ball without the aid of a ramp. Incorporating Kegel balls also has the added benefit of a thinner gutter and, in turn, a thinner overall installation which could be a good option if space is an issue. This combination offer a great installation size for customers with space limitations. 5 Kegel balls are generally enough for a double-lane installation.